Creating a workforce that feeds motivated workers into local projects strengthens and inspires localities, and can focus on both short and long term objectives. The Peace Corps has been a leader in international development and citizen diplomacy for more than 50 years across more than 139 countries. In an increasingly interdependent world, we tackle challenges that know no borders—such as climate change, pandemic disease, food security, and gender equality and empowerment. Although times have changed since the Peace Corps’ founding in 1961, the agency’s mission—to promote world peace and friendship—has not. Today, the Peace Corps is more vital than ever, working in collaboration with partner organizations and using cutting-edge technologies and well-tested best practices to enhance impact. Our more than 215,000 current and returned Volunteers know that the Peace Corps changes lives—both their own and the lives of people in communities around the world. They learn about leadership, ingenuity, self-reliance, and relationship building and become global citizens. Peace Corps Volunteers reflect the very best of humanity, innovation and aspiration for a better tomorrow. When they return home, they share their stories and experiences and give back to their own communities, helping to strengthen international ties and increase our global competitiveness. The Peace Corps is an integral part of the global community helping to eradicate disease, feed the hungry, and address other worldwide challenges through innovative, grassroots solutions. Peace Corps Volunteers today employ modern technology and tools to work in new ways with host country communities. The Peace Corps is a life-defining leadership experience and launching pad for a 21st century career. The Peace Corps Times is a semiannual publication for Volunteers in the field. Revamped in 2014, it provides news and information from headquarters, posts, and Volunteers. 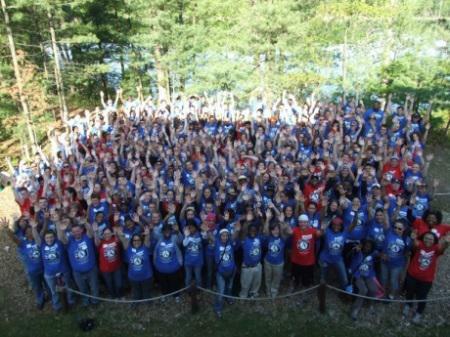 This is the broadest network of AmeriCorps programs. These groups recruit, train, and place AmeriCorps members to meet critical community needs in education, public safety, health, and the environment. AmeriCorps NCCC is a full-time, team-based, residential program for men and women ages 18-24. Its mission is to strengthen communities and develop leaders through direct, team-based national and community service. Every year, nearly 3,000 young people join City Year and dedicate 11 months to make a lasting impact on students and communities across the country. #makebetterhappen is a place where you can hear some of the great things that are happening every day, from the corps members themselves. It’s a place where thousands of stories all add up to #makebetterhappen. At City Year, we believe education has the power to help every child reach his or her potential. However, in high-poverty communities there are external factors and obstacles students are faced with every day that can interfere with their ability to both get to school and be ready and able to learn. But it’s these students who need a bit of extra, individualized support. But there’s a gap between the kind of help they need and the support the schools are designed to provide. America’s schools are designed to provide extra support to just 15% of students. But in many high-poverty communities, 50% or more students require additional support academic, social, or emotional support. The result of this gap is a shockingly high dropout rate in high-poverty communities. And when a student drops out of school, it not only affects him or her, it also has a lasting effect on our communities and society as a whole. Within these communities, dropouts are often highly concentrated, so we’re able to identify and target the specific schools that are in need of extra support. From there, we can start working to put students on the right path to graduation—which is where City Year comes in. At City Year, we partner with most at-risk schools to help bridge the gap between what their students need and what the schools are designed to provide. In doing so, we’re helping students reach their full potential and graduate high school in communities all across America.